It’s time for GiveMore 24! Do you know about Give More 24? It’s a one-day, online giving marathon just for Southwest Washington, focusing on raising money for organizations that serve Vancouver and Clark County–organizations like Friends of Trees! Give More 24 takes place on Thursday, September 20–and we can use your help to spread the word to raise some money for more trees + community in Southwest Washington. Like, comment on, and share this Facebook post! Like, comment on, and share this Instagram post! DONATE TO FRIENDS OF TREES! Even though the main day for giving is September 20 you can donate now–and we hope you will! PS: Any chance you’ll be in downtown Vancouver around 7:00 a.m. on September 20? There’s a Give More 24 rally in Esther Short Park at the foot of the clocktower. Yep, it’s early. Yep, there’ll be coffee & donuts. Yep, there’s a dance-a-thon at 7:24 a.m. Yep, we’ll be there (weather permitting) and we’ll have your favorite dancing-high-fiving tree, Garry Oak! Plus, our good friends at the Portland Timbers are sending Timber Joey! What a time, Join Us! More trees on the horizon for Vancouver! Friends of Trees will be on Vancouver’s Westside on February 21st. You can plant with us and learn more about how we work with local communities to plant trees together, by visiting our volunteer page. The Port of Vancouver USA is partnering with Friends of Trees Friends to grow the Vancouver urban tree canopy. We’ll be working with The Port to help plant trees across the city as part of their efforts to mitigate property development impacts. Thanks to this new agreement, FoT is aiming to increase the number of street trees it plants along the city’s right of ways – a.k.a. planting strips. A mitigation tree is a wonky term used for a tree that is planted to replace one that’s been cut down elsewhere. Most cities require mitigation trees to be planted as a condition of development. Preferably, a tree is on the same property a tree was removed from but if this isn’t possible, there are other options: The City of Vancouver allows trees to be planted at other locations within city limits as a condition of removing trees. Paying into Vancouver’s Tree Fund is another option, though often more costly. Many of these street trees that we’ll be planting are funded by The Port and will be of no cost to homeowners. The care and responsibility of these new trees will remain under stewardship of the adjacent property owner. FoT provides watering reminders and health checkups to help these trees thrive. FoT also offers ooze tubes to help make watering easy and convenient! Because we entered this agreement nearly halfway through this year’s planting season, we’re offering FREE STREET TREES to all customers for our remaining neighborhood plantings now through March 2015. Starting next planting season, Friends of Trees will be offering free street trees to select neighborhoods throughout the city—a list that will change on an annual basis. Please help spread the news and stay posted for the release of next year’s free tree neighborhoods in early summer. From this moment forth, we’ll need more help than ever identifying planting locations and recruiting tree planters in Vancouver! Would you like to help get more trees planted around Portland and Vancouver while talking with people interested in the same thing? If so, we have a volunteer role for that—the Call Star! Last week was Major League Baseball’s annual All Star Break—celebrating the best players from every team. And next week, Friends of Trees is gearing up for its Call Star season—when we get to work with some of the most passionate, articulate and enthusiastic volunteers. Maybe you fit this description? Friends of Trees‘ partnership with Vancouver began informally in 2001, when two trees were planted in Edgewood Park. Over the years, especially since 2003, the number of trees planted each year has increased. In February, Friends of Trees and Vancouver Urban Forestry set three records at the biggest neighborhood tree planting to date in the city. 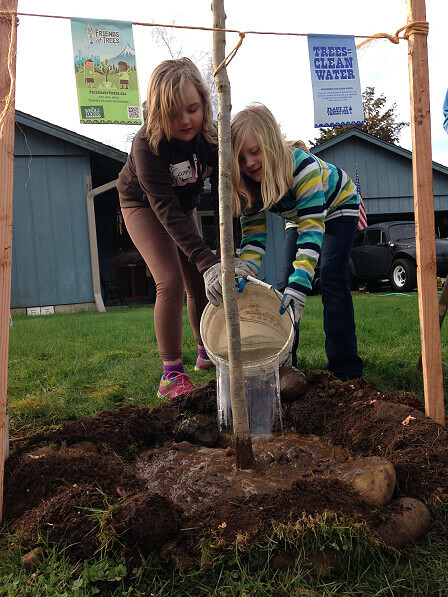 During the season, Friends of Trees planted 447 trees in Vancouver—more than in any previous season. 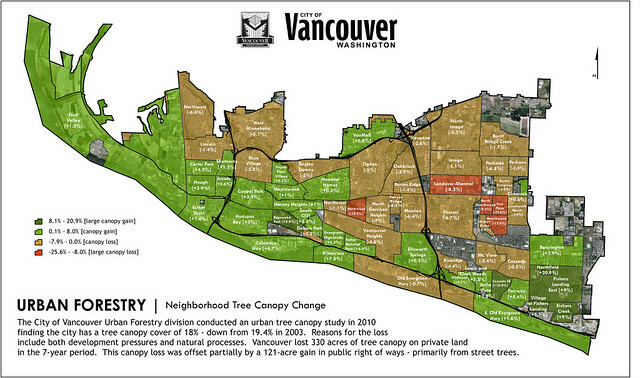 In this map showing urban tree canopy change in Vancouver between 2003 and 2010, Ian notes the following: “The City of Vancouver Urban Forestry division conducted an urban tree canopy study in 2010 finding the city has a tree canopy cover of 18% – down from 19.4% in 2003. Reasons for the loss include both development pressures and natural processes. 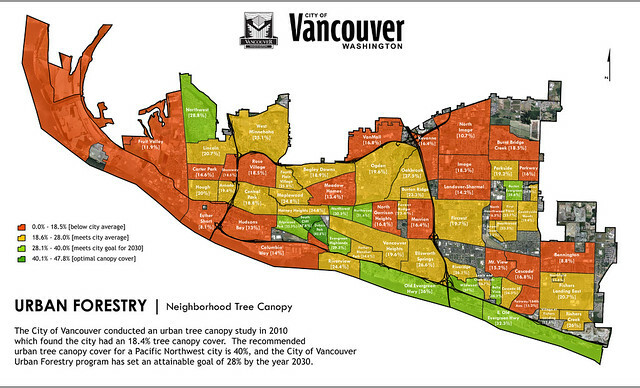 Vancouver lost 330 acres of tree canopy on private land in the seven-year period. This canopy loss was offset partially by a 121-acre gain in public rights of way, primarily from street trees.” These street trees were planted by Friends of Trees in partnership with the City of Vancouver Urban Forestry division. Clearly there’s more work to be done, but progress has been made where citizens join community tree plantings to add trees to their neighborhoods. Vancouver schedules four plantings with Friends of Trees each year, and Charles Ray, Vancouver’s urban forester, anticipates 450 new trees each year over the next five years. Friends of Trees looks forward to setting more records during the 2013-14 season.